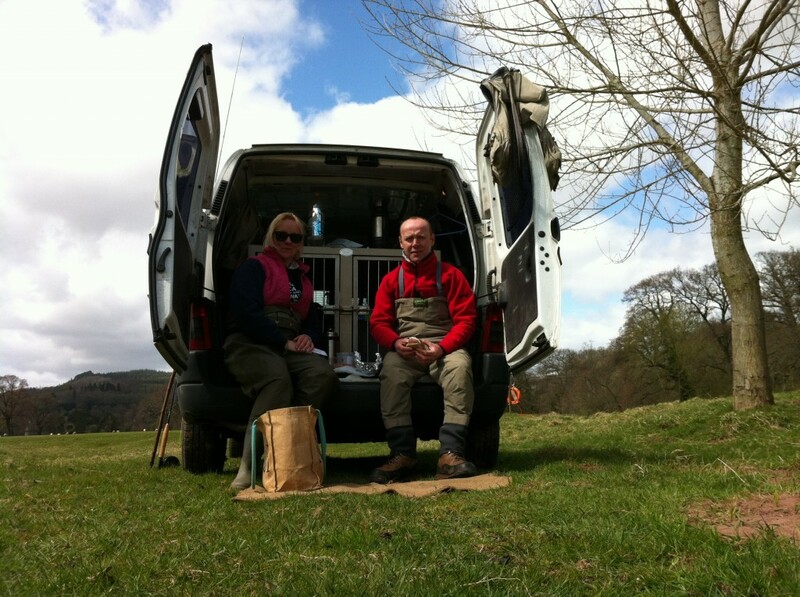 Heres the most recent donation to Parkinsons UK from Lee Watts Fly Fishing. Thanks to everyone who has paid for my services in the last few weeks. Thank you so much for your gift of £30.00. Your donation will help us find a cure and improve life for everyone affected by Parkinson’s. The name which will appear on your bank statement against the donation will be Parkinson’s UK. 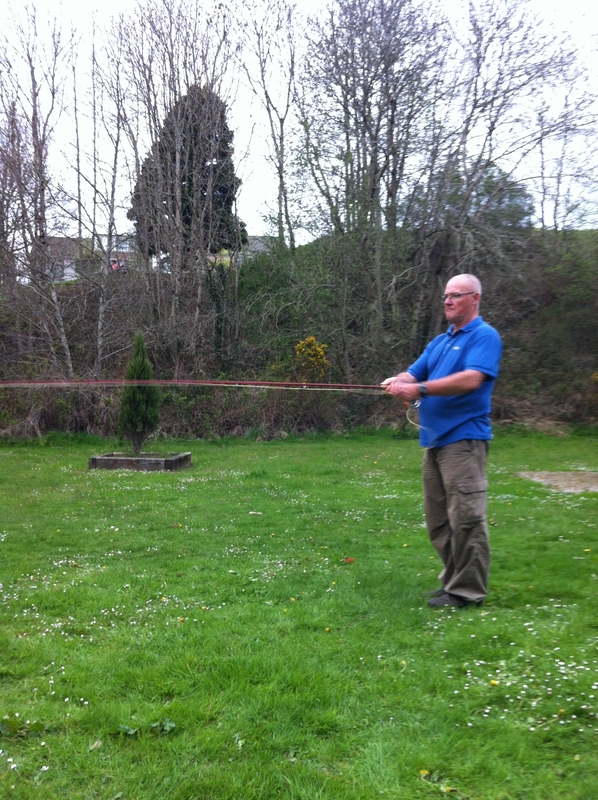 Yesterday evening I had the pleasure of teaching Chris from Neath how to double haul his beautiful 9’6″ #7 hardy angel. The wind was a real pain, changing direction every other cast. This didn’t make the task any easier for what can be a difficult skill to learn, especially for more experienced anglers who have been casting with out a haul for sometime. Chris had a nice cast to start with. 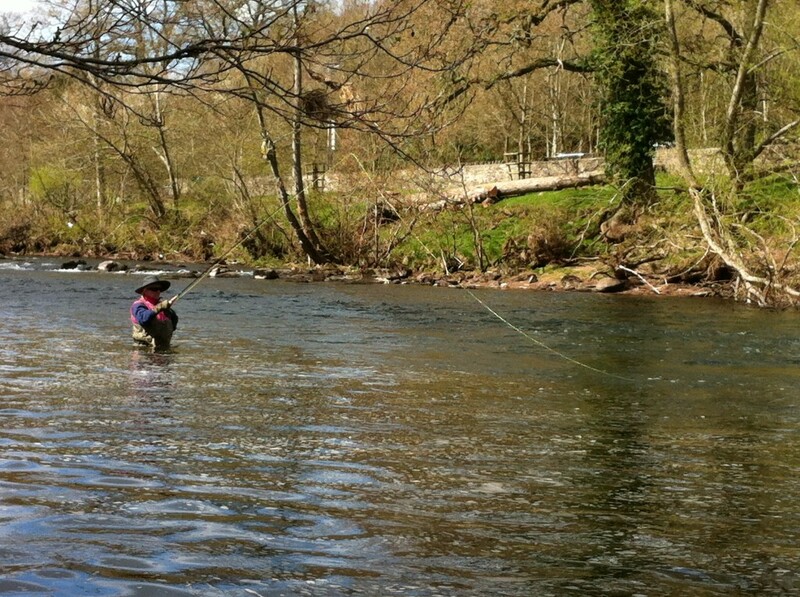 He fishes Eglwys Newydd and does really well there but wants to do better against that wind that blows over Swansea bay. Chris strung up with a #7 airflo 40+ and level 10′ leader and fluff. I demonstrated the difference that a good quality tapered leader makes to the turnover of the cast, which against a level leader is quite dramatic. Firstly Chirs had to understand why it was important to be able to change the shape of his loops and cast clean slack free loops. I explained that its pointless learning to haul if all you are doing is taking slack out of the cast. After an hour or so the loops where looking sharper, tighter and cleaner so it was time to concentrate on that hauling hand. After using the method fellow AAPGAI instructor Lee Cummings(www.stsflyfishing.co.uk) showed me, Chris started getting the timing right on his double haul. If you’ve not tried it, then imagine patting your head while rubbing your belly. After a little practise on his own over the coming week, im sure Chris will have an effective haul in no time. Well done Chris, it was a great lesson. Down from the big smoke! 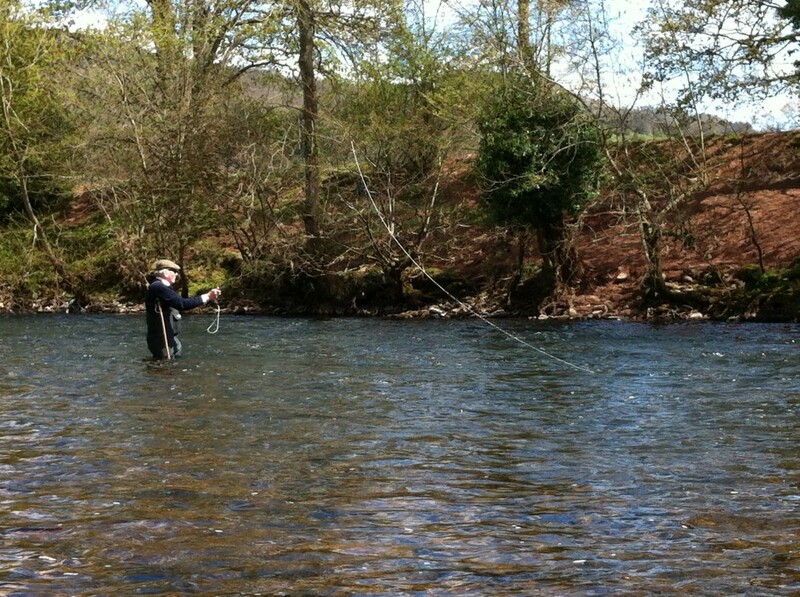 Yesterday saw me guiding father and son team Andrew and David who where spending a week in Crickhowell fishing the usk. Andrew has fished before on the usk but this was Davids first time. 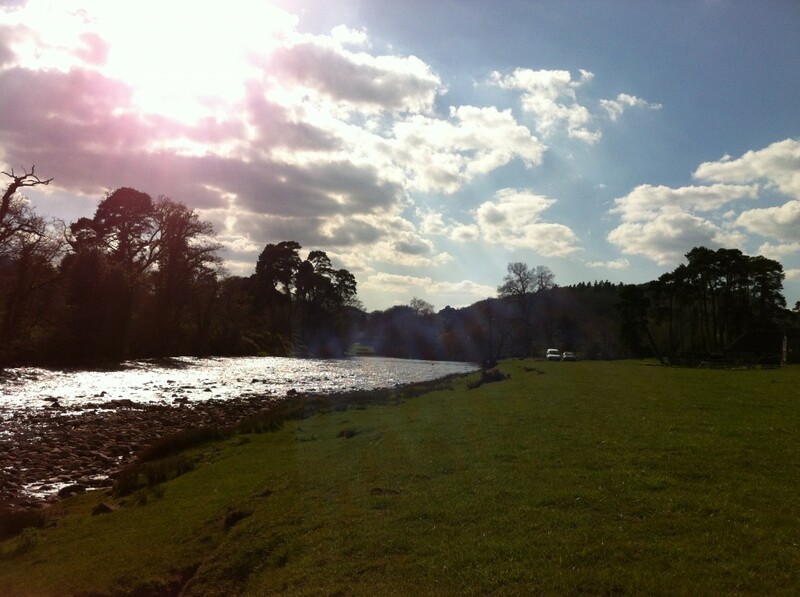 This was going to be my second day in a row at www.glanuskestate.co.uk and I expected good fishing, just like I had the day before with Susie. Lighter winds but stronger sunshine were the order of the day. and after a slow start David started to hook some fish. ‘Hook’ being the word because none of them came to the net. The first fish that he had on was a good one too (Tiggy said, “must try harder David”). 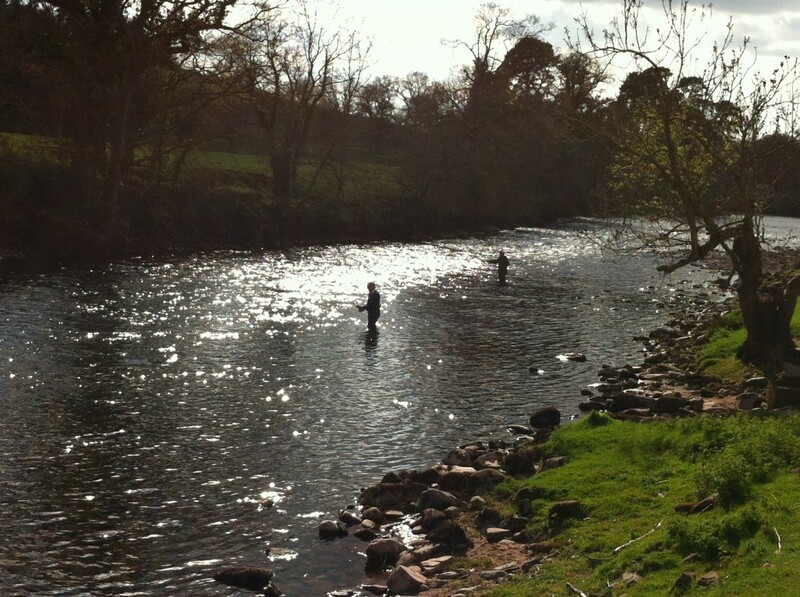 Throughout the day we used double speys and C-spey casts to get the best from the team of two spiders, and with my trusty wading staff there was no stopping David. 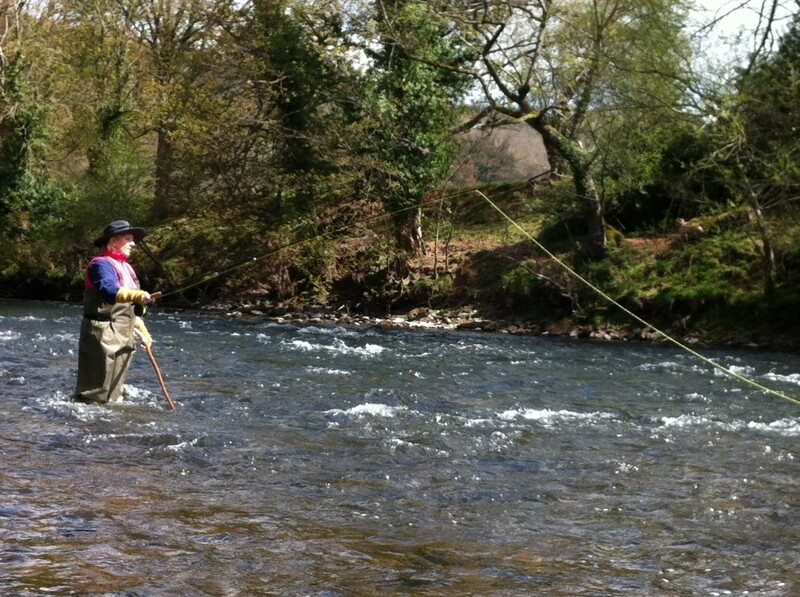 Of the two, Andrew saw less fishy action but did enjoy the leaky waders he had on. It was nice to see such a good father/son relationship between the two of them, they seemed to be having a great week in sunny Wales and it would be great to see them again. Nice rhythm by this point. Thanks for the chocolate brownies Tiggy! At evening time, it shall be light! Monday saw part two with 30something Llanelli socialite Susie. A few weeks ago Susie had some casting lessons with me in the park. After practising her loops she was ready to fish the prestigious waters of www.glanuskestate.com on the middle usk. A team of spiders in the streamy water was called for. 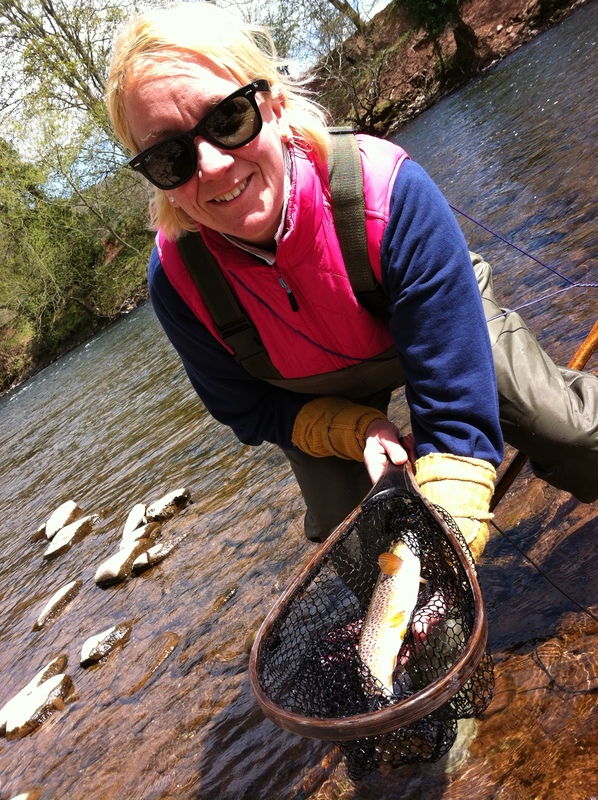 With the high sun came a strong westerly, so having set her up with a double spey Susie gingerly worked her way across and down the water, losing a few fish and catching a couple. Using a silly hat to hide herself from the fish, susie picked up another fish on the next run. She lost a few aswell so shes not perfect yet! 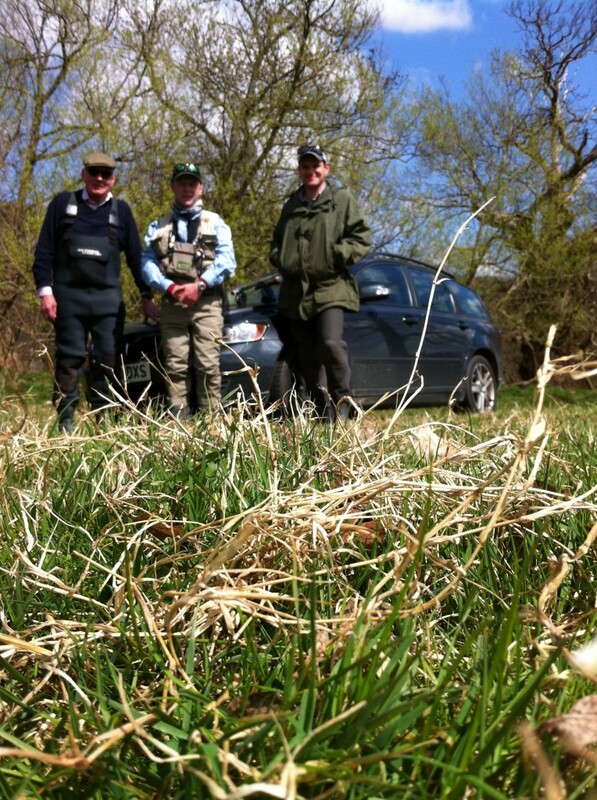 Its really nice when you can follow through from giving casting lessons to fishing the river. Well done Susie, you practised hard and reaped the rewards with a great day on the usk. Now practise those knots and you can have some tea!